I wonder what else they will find? And so the world goes round and round! 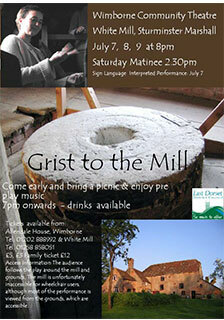 A play set in and around White Mill, revealing local folk stories and facts, including the story of the Knowlton Bell and the Shapwick Monster, and H S Joyce’s account of his life at White Mill in the 19th Century. The following items from Grist to the Mill have been stored in our materials archive. Click here to view.